Ben Gray hit a hat-trick as Arundel secured a first SCFL Premier Division win of the season at the eighth time of asking on Saturday. As well as Gray’s treble, debutant James Thurgar netted along with frontman Harry Russell to wrap up an emphatic 5-2 victory over Peacehaven & Telscombe at Mill Road. Mullets had failed to win any of their previous seven league outings to start the season and were on the back of a surprise Sussex Senior Cup first round defeat at division-lower Selsey last time out. Arundel boss Simon Hull was less than impressed with the cup exit but was delighted with the response shown as his side served up a five-star display to see of the Magpies. He said: “We had an honest and open chat as a group on Thursday which was really positive. 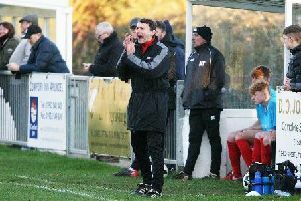 “I can’t praise the boys enough for their attitude and performance against a good Peacehaven side. “The new faces Jordan (Layton; from Worthing United) worked tirelessly in the middle of the park and gave us great energy alongside Matt (Noble). James (Thurgar; from Pagham) was a constant threat and took his goal very well. The introduction of the new faces, along with Jordan (Farrell), has really lifted the camp and kept everyone on their toes, there is real competition for places now and that really sharpens the minds of the entire squad. “We were clinical, Ben (Gray) has shown quality and been a threat for us all season. He deserved his hat-trick. Liam (Brady) is creative and improving week on week while Harry (Russell) worked tirelessly through the middle for us again. “I can’t single anyone out, the back five were magnificent and we’ve been solid at the back all season. “It was a real team performance and everyone was at it for 90 minutes. “We have so much to work on but the willingness is there and the lads will apply themselves. Gray capitalised on a goalkeeping error by Magpies stopper Alieu Secka, making it 1-0 after 25 minutes. Fellow frontman Russell doubled Arundel’s lead ten minutes later as they took control. Peacehaven pulled a goal back through Curtis Ford but a brilliant effort from Gray, his second of the afternoon, restored Mullets’ two-goal advantage minutes before the break. Debutant Thurgar was impressive and he made it 4-1 three minutes after the restart. Mullets were seemingly cruising but Peacehaven pulled another back when John Elliott struck 20 minutes from time. Impressive Arundel were not about to let the lead slip, though, and Gray struck from the spot two minutes from time - completing his hat-trick - a great day for the home side. ARUNDEL: Stevens; Jelley, Gibb, Dudas, Litterick, Layton, Brady, Noble, Russell, Gray, Thurgar. Subs: Jarvis, Hawkes, Griffin, Jephson,, Hornsby-Smith.